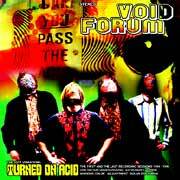 Void Forum - "Turned On Acid"
Please don't be confused. This is Vibravoid but a compilation of the early material before the band really became Vibravoid. It includes tracks from 1994-1997 and the CD also has a pretty cool video from 1994 as well that you can see on your computer. The guitar player, Christian Koch, is the only member that is in all the line ups, starting with the earliest band, Motley Motion. The CD begins with "Void Forum" and these tracks are from 1994-1996. This very much 60's psychedelic music played at its best in the 90s. Really cool stuff. The cover of "Astronomy Domine" by Pink Floyd is pretty close to the original but mixing in some stranger sounds here and there. It is also on the MPEG video. Next up is some of the tracks from the sessions that would be the first Vibravoid LP, 2001. Finally, the CD closes with the earliest material (very raw 4-track stuff) from Motley Motion. This includes a really far out and cool 15 minute version of "Fire", by Arthur Brown. A very cool CD with a great glossy book and liner notes!